Technical Dribbling & Turning (Sequential Training). A basic fundamental action for any age group in a game at any level or size of field. The more the repetition, the more the experience the more fluidity & efficiency to become a good habit. Organization: An area of 10x10yds with a maxium of 6 players in each area. One ball is used with a few available if a pass is not accurate. Starting Point: The play begins with player at &apos;A&apos; who dribbles the ball to point &apos;B&apos; and turns with the ball to play an accurate pass (look before passing) to point &apos;C&apos;. 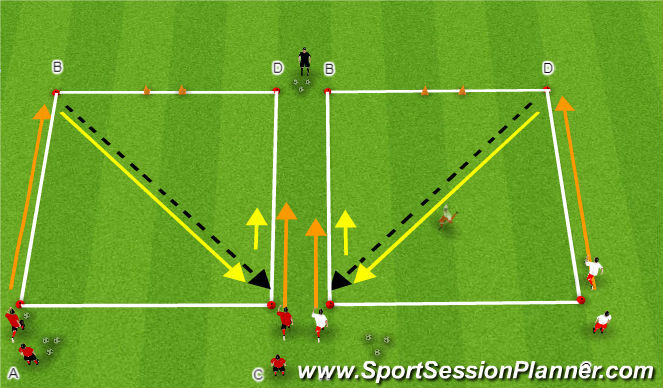 PLAY: After passing the ball, Player &apos;A&apos; sprints and pressures Player &apos;C&apos; forcing him/her to stay wide as Player &apos;C&apos; dribbles to point &apos;D&apos; and turns (same turn as at &apos;B&apos;) and passes to Player &apos;A&apos; and sprints and pressures the player to stay wide and the process repeats for 2-3 minutes (allows for repetition) before the &apos;type of turn&apos; is changed. After the player pressures without tackling s/he returns to the end of the line point &apos;A&apos; or &apos;C&apos; to repeat the action(s). Coaching Points: Dribble with speed; Turn quickly while shielding the ball; look before you pass; pass to forward foot and sprint to pressure; slow down as you approach the player with the ball force them away from the middle. As a licensed coach, look to add more types by watching players at the top level so you can explain to players where they might use this technique in a game!